Click here to listen to Hollywood 360 AM560 WIND radio podcast with Tyna Cline. 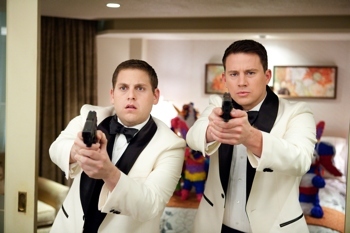 Scenario: Schmidt (Jonah Hill) and Jenko (Channing Tatum) are rookie police officers anxious to make their first bust. After a rough start as bicycle cops, they are recruited into a program that’s being rebooted from years earlier. Schmidt and Jenko join 21 Jump Street as undercover officers sent into a high school as students. Their mission is to determine the source of the street drug, H.F.S., which has recently caused the death of a student. Unfortunately for Schmidt and Jenko, they mix up their false identities on their first day. Now, Schmidt, who is generally considered a geek, has to pull off the persona of a cool jock. Jenko, on the other hand, must assume the identity of a non-athletic geek who takes classes like AP Chemistry. The ways of high school have changed since they graduated 7 years ago, and they must quickly learn to adapt. Film Critique – What to Expect: In this age of recycled material there have been many failures, but “21 Jump Street” is not one of them. The humor is sharp, although sometimes overly crude, and the comedic timing of Hill and Tatum is impeccable. The two play well off each other and it’s hard to imagine why Tatum has not tackled more comedy. The supporting cast is just as good, especially Ice Cube as the anger ridden Captain Dickson. Full of tongue-in-cheek humor, the script is not afraid to laugh at itself, right along with the audience. The heartiest laughs appear in the first half of the movie, but the action keeps is going through to the end. Watch for cameos from stars of the original TV series; you won’t be disappointed. To See Or Not To See: See it, as long as crude humor does not offend you. It’s a fun-filled, screwball comedy that’s sure to provide plenty of laughs.